Shelley Bean: Scrapalicious Challenge #11-Use a Bear! The card I created today has loads of layers. I had a lot of fun using all the cool products I received from the Scrapalicious USA store. From my Fizzy Moon stamp to the prima pearls..you can buy it all at Scrapalicious at lower prices than I have seen anywhere. And let me introduce you to Trimcraft UK papers...oh, just let me get started. These papers are heavy weight, rich textures and colors...the highest quality I have found anywhere. I happily endorse them and will be buying more! So, come join us at the challenge blog with your bear inspired project and pop on over to the store and see what all there is. Tell Cindy that Shelley sent you!! this card is so sweet! I must find that image for my baby girl!! Thanks for joining us this week at Stamp Insanity! This image is just too cute! Love your color work too. Thanks for joining us at the Fuzzy Wuzzy Challenge this month. This is perfectly cute! :) Love the image and your colouring is great! WOW this is so beautiful. I love your coloring. Thanks so much for playing along with Use it Tuesday! Such a cute image! love the card. Beautiful card:) I love the image! TFS! Thanks for showing your work at The Fuzzy Wuzzy Challenges. Hope to see you again! 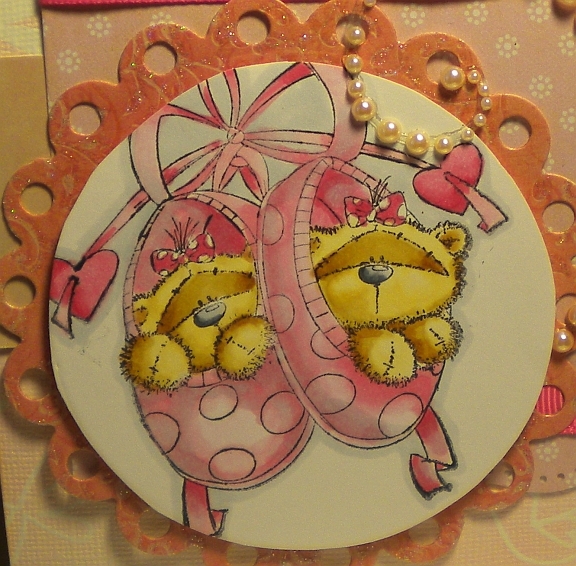 Such a cute card, love it, do you know you got in the Top 3 with this one at Hookedoncrafts? Congrats.